in South Florida on September 25th, Family Fun Day sponsored by South Florida Behavioral Health Network/ Concept House starts at 10:00am. Located at Morningside Park in Miami, there will be a BBQ and lots of fun with games, sack races, food and more. Contact Martha Morales at mmorales.concepthouse@yahoo.com for more information. Find your local event for Recovery Month or have one! Put your zip code in the box on Recovery Month page. Click here. Come back here to watch the quick and powerful video. Make a difference in someone’s life today. Download the 2010 Recovery Kit today. Click here. Follow Recovery Month on Twitter and join their group on Facebook. MUST WATCH VIDEO . PASS IT ON. As a parent advocate, I continually receive information from a wide range of resources. Educating parents today about what our teens and pre-teens are facing is critical to raising our children. Today, as in many generations before, there are new concerns and challenges that parents face. Whether it is social networking, peer pressure, or substance abuse – parents need to stay in touch. Studies and common sense tell us that parents play a critical role in preventing substance abuse among teens by simply talking to them about it. 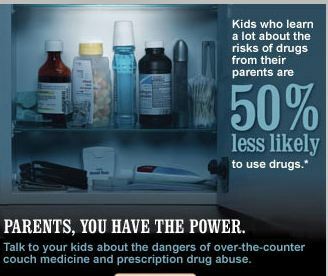 CHPA’s Stop Medicine Abuse initiative empowers parents, as well as other community members, to get educated and take action in a variety of ways. 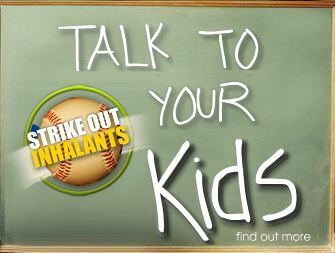 Ultimately, the goal is to make sure parents talk to their kids before someone else does. is aware of other kids abusing products. — emphasize that unsafe actions and risky behavior have serious consequences. products that can be abused; and you don’t want to give them suggestions. one priority. Tell them again…and again…and again.